A triple-treat dessert with a shortbread base, gooey fruit filling and zingy lime sponge. Preheat the oven to 200°C, gas mark 6. Grease a baking tin or roasting tin about 16cm x 19cm and line with baking parchment that comes 3cm above the tin. Place the berries in a large pan with 50g of the caster sugar and 100ml cold water. Bring to the boil, cover and simmer for 10 minutes. Remove the lid and continue to simmer for 20 minutes, stirring frequently, until sticky. Allow to cool completely. Meanwhile, place 125g of the sugar in a food processor with the butter, plain flour and coconut. Pulse briefly to combine, then press into the prepared tin and bake for 20-25 minutes until golden. Leave to cool completely. Spread the berry mixture over the cooled shortbread base. Reduce the oven to 170°C, gas mark 3. To make the lime sponge, beat the eggs with the remaining 100g of sugar until thick and pale. Then stir in the selfraising flour with the lime zest and juice. Top the berry-topped shortbread with the lime sponge and bake for 45-50 minutes until the sponge has set. 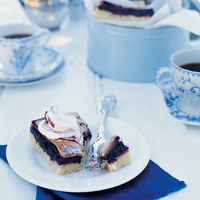 Allow to cool, then dust with icing sugar and cut into slices. Lightly whip the cream, if using. This dessert, or the berry mixture can be made up to 2 days in advance. Any leftovers will keep in an airtight container for up to a week. To transport, place the slices and cream in separate plastic containers, and chill. Stir 3-4 tablespoons of the coulis, if using, into the whipped cream to give a marbled effect, then dollop on top of each slice and serve with extra coulis poured over.